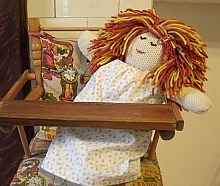 I made this knitted doll for my daughter for Christmas and never got around to posting it on here. The pattern is from Wee Folk Art and I really enjoyed making it. 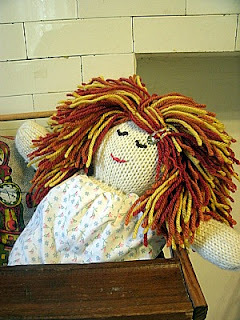 I haven't knitted a doll in awhile and was surprised how fast she knit up. It only took my about 8 or 9 hours including the hair which is by far the most time consuming and mind numbing part. It was totally worth it though! I have been thinking about doing a real giveaway. Just a little one to start out. I have no idea how to go about it, but I was thinking of just doing a giveaway of some vintage crafty type stuff I have. We are going to try and sell our house this spring so I seriously need to unclutter. 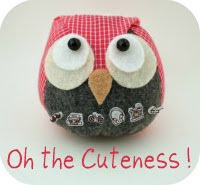 My crafty stuff is the biggest clutter maker in our household. I have some (and by some I mean a ridiculous amount) of metal embroidery hoops and some vintage sewing patterns I will probably never get around to making. Would that be fun or just me trying to unload a bunch of my crap on someone else? If you have any comments or advice I would appreciate it!